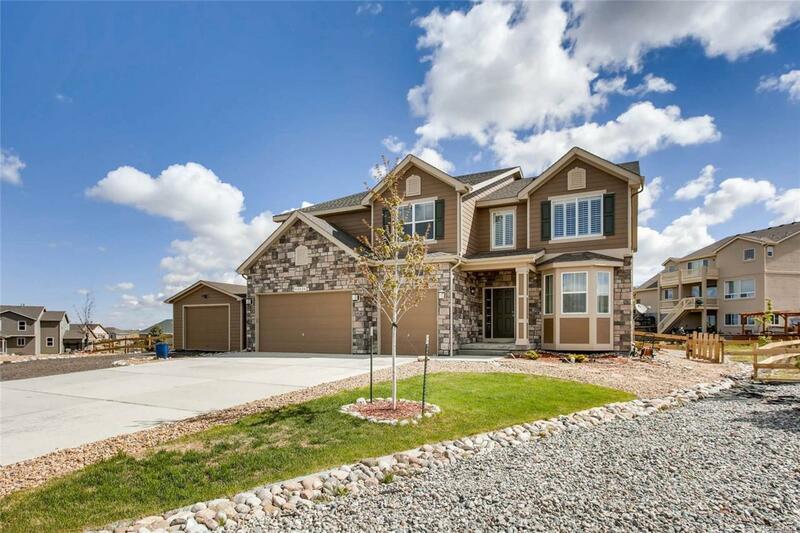 Why buy a new build when you can move into this 5 bed/4 bath home with over 6,000 total sq feet? This elegant home features everything you need: open floor plan, front and backyard already landscaped, located on a cul-de sac, and a 396 sq ft outbuilding included! Some of the special features include vaulted ceilings, hardwood floors, arched doorways, wrought iron staircase, spacious kitchen with granite counter tops, double ovens, gas cook top, custom pot filler, walk-in pantry. Enormous master suite with large walk-in closet, master bath with separate vanities, soaking tub, and walk-in shower. Main floor guest bedroom, plus a loft and 3 additional bedrooms upstairs. Upstairs laundry room with utility sink. Full unfinished basement. Beautifully landscaped backyard with covered deck, pergola, and enclosed barbecue area with gas hook-up. Additionally, the backyard features a flagstone patio with fire pit. Large lot with 3-car garage. Recently appraised at $570,000! Terrific value!